The FIVB Men’s World Championships Final Six kicked off in style with a hard-fought five-setter between Brazil and Russia, with the Brazilians winning the final three stanzas to steal away the victory. After falling behind 2-0, the defending Olympic champions bested the 2018 Volleyball Nations League champs in five sets, putting on a show for the Italian crowd of nearly 9,000 at Turin’s Pala Alpitur on Wednesday. Russia outblocked Brazil 14-6 and owned the edge in kills (60-57) and aces (7-6), but were done in by 38 miscues (to 26 by Brazil). Wallace De Souza paced the Brazilians with 22 points (19 kills, 2 aces, 1 block), while three other players turned in double-digit scoring efforts. Luiz Felipe (15), Douglas Souza (13) and Lucas Saatkamp (12) rounded out the scoring. Felipe turned in 13 kills and a team-best two blocks, while Souza added 10 putaways and two stuffs. Saatkamp chimed in with 10 kills, a block and an ace. Brazil utilized 13 of its 14 players in the match, including two liberos and two setters. Brazilian backup setter William Arjona became the unlikely hero in the match, serving up two aces and kickstarting the offense en route to the victory, and remaining in the starting lineup the rest of the match in place of Bruno Mossa Rezende. Dmitry Volkov led a group of four double-digit scorers for Russia, accounting for a match-high 23 points with 19 kills, three aces and a block. Maxim Mikhailov added 19 (15 kills, 3 aces, 1 block), followed by Dmitriy Muserskiy‘s 17 (11 kills, a team-best 6 blocks) and Egor Kliuka‘s 11 (9 kills, 2 blocks). Russia walled in Brazil with the block (9-1) in the first two sets, but all of that changed in the final three. After playing their way to into a tiebreak, the Brazilians took control at 5-4 on an ace by Saatkamp, but Russia followed Mikhailov to a 6-5 advantage. 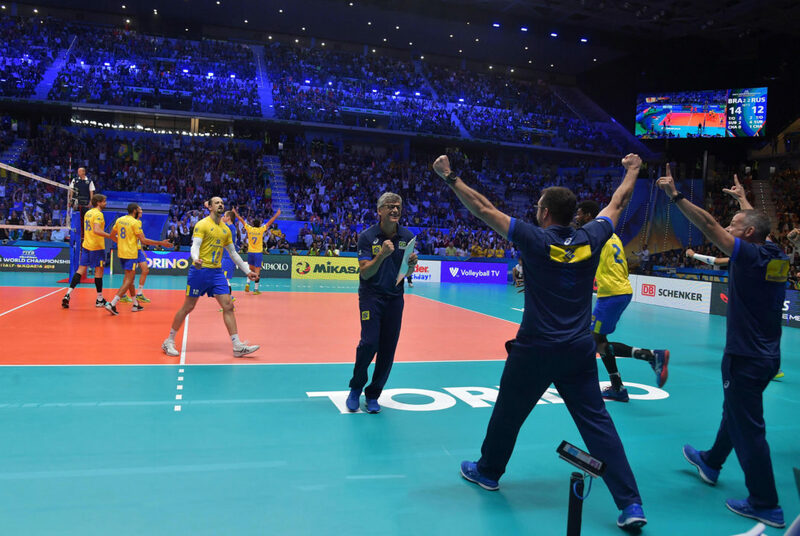 De Souza gave Brazil the edge, but a lineup change gave Russia new hope as Sergey Grankin and Victor Poletaev came in and enforced their will on the block. Saatkamp responded with a stuff of his own to punctuate a long rally and put Brazil on top 13-10. Another stuff, this one by Souza, closed out the comeback win at 15-12. Russia will look to bounce back with an 11 a.m. Thursday match against the USA.